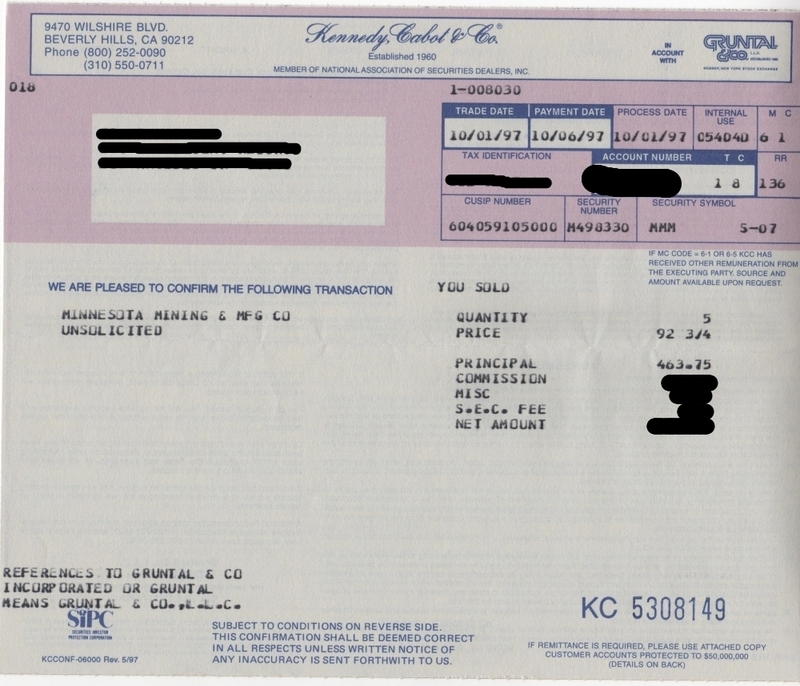 A while back I wrote a couple articles highlighting my very first dividend stock that I owned along with some scanned images of the very first stock trade I placed back in 1988 along with my first dividend check received for $5.00 also in 1988. You’ll see a trade for 100 shares of Homestake Mining Co. along with a discounted commission of $41.52. In those days that amount was considered a very cheap commission rate as many of the large “full service” brokerages charged anywhere from $100 to $300 a trade. Thank you Internet for reducing commissions to next to nothing or free even with the likes of Loyal3. 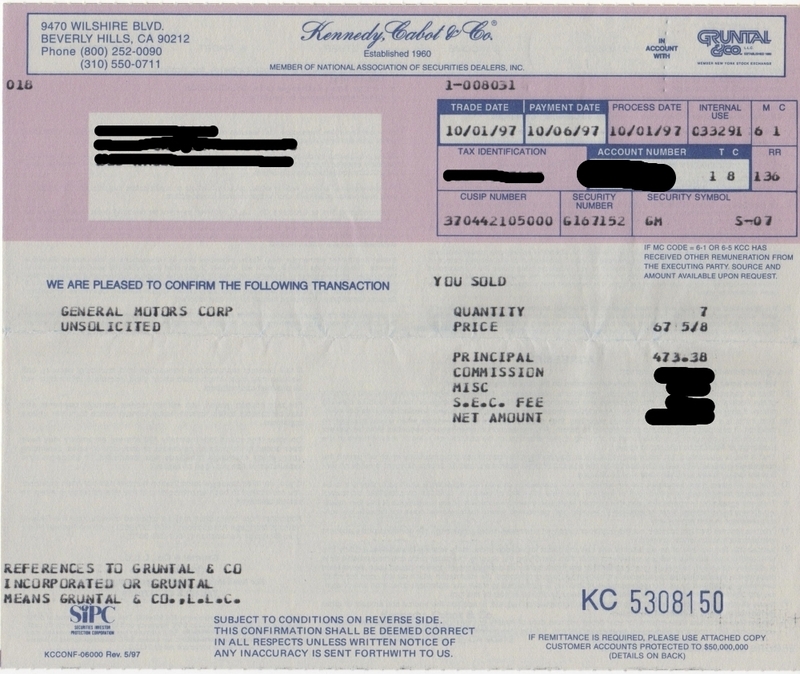 Going through more of my old papers I found several stock trades I placed in 1997 following David and Tom Gardner’s stock picking method called the Foolish Four. For those of you who do not know, David and Tom Gardner are the founders of the popular investor web site The Motley Fool. The Gardner’s popularized an investment strategy called the Foolish Four which basically was a modification of the Dogs of the Dow investment strategy popularized by Michael B. O’Higgins. The Dogs of the Dow is a basic investment approach whereby on an annual basis you purchase stock in ten companies from the Dow Jones Industrial index that have the highest current yield and lowest price. The premise of this approach suggests that higher yielding Dow stocks tend to have a weakened share price and thus are at a low point in their business cycle and have a greater chance to rise relative to their lower yielding counterparts. The Foolish Four method is simply a more concentrated version of the Dogs of the Dow whereby on an annual basis you purchase the top four, instead of ten, highest yielding lowest priced Dow stock. Following the Foolish Four method in 1997 the highest yielding, lowest price Dow stocks were, International Paper Company (IP), Chevron Corporation (CVX), though in 1997 the ticker was CHV prior to the merger with Texaco, General Motors Company (GM) and 3M Company (MMM). The purchases were all made January 10, 1997 and later all sold October 1, 1997. Not quite a full year but close enough as each trade was profitable and I was able to collect dividends while holding each position. Let’s examine each one of my Foolish Four trades a little deeper. First up, International Paper Company (IP). I bought 19 shares at $41 3/4. For the new dividend investors, stocks quotes were expressed as fractions instead of decimals. 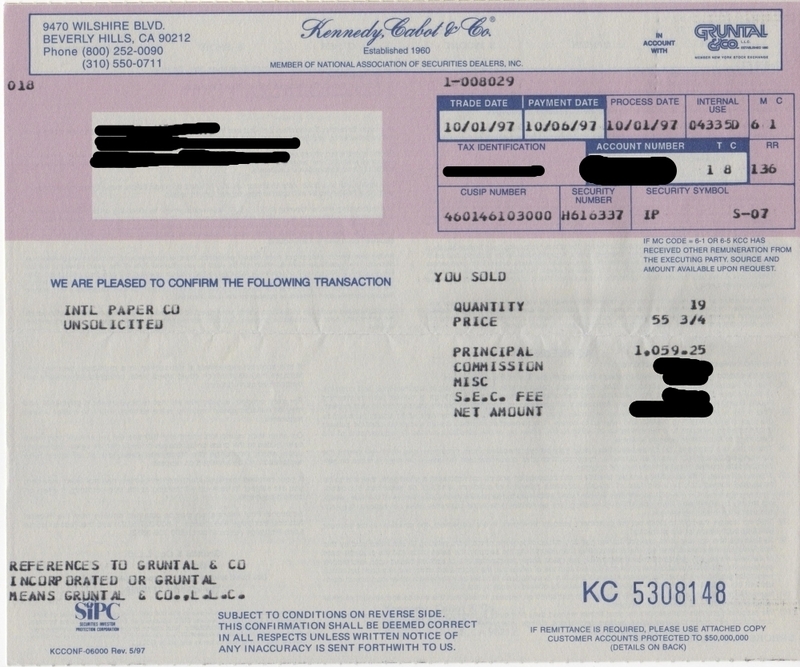 I later sold my IP at $55 3/4, a 33.5% increase. Not bad for ten months of holding and this doesn’t factor in dividends received. My second stock of the Foolish Four strategy was Chevron Corporation (CVX). I bought 6 shares at $60 1/8 and sold ten months later at $84 1/16 for a capital gain of 23.4%. I can only imagine what my CVX would be worth today had I not sold it back in 1997 especially since this stock had an amazing twenty five year annualized dividend growth rate of 7.51% well exceeding the inflation rate. Next, I bought 7 shares of General Motors Company (GM) at $60.00 and later sold at $67 5/8 for a gain of 12.7%. Of course, about a decade later GM had to file for bankruptcy protection and essentially wiped out all shareholder value. Clearly, not every Dow component, or any stock for that matter, is immune from basic business incompetence. Finally, I bought 5 shares of 3M Company (MMM) at $83.00 and sold my position at $92 3/4 for a gain of 11.75%. Like CVX, MMM has an amazing twenty five year annualized dividend growth rate of 6.47%. I can only imagine what my shares and yield on cost would be today had I not sold my position back then. The above examples causes me to wonder what my total return would have been if I simply held each of these four stocks through today while constantly reinvesting my dividends. Of course, GM filed for bankruptcy and essentially wiped any shareholder value a few years ago which just goes to show that as dividend income investors it’s not about ‘buy and hold’ rather ‘buy and reassess’ as fortunes of even the most stable companies can evaporate quickly. Just look at former “solid” Dow components Kodak and mega-retailer Woolworth. Makes you think of where WMT or TGT might be headed someday. In all, I can’t complain about my Foolish Four experience as each stock I held accounted for double digit gains in a short period of time. A successful investment, yes. A learning experience, definitely. Have you ever tried the Foolish Four or Dogs of the Dow investment strategies? Let me know below. Ah, what could have been. Divhut you’ve highlighted one of my biggest investing struggles. I am often too quick to take profits. I’ve learned over time that some companies should just be own, and not traded. Unfortunately, it took a decade for the concept to sink in. There is a definite difference between being an investor and trader. Too often we are compelled to sell our winners for some short term gain and fail to re-enter these great companies and focus on longer term growth and dividends. Still, it was an interesting method to follow and each of the four trades gained double digits which was nice and looking forward I am very clear in my objective. Thank you commenting. My first stock was Coca Cola back in 1996, I think. I was 13. I’ll have to do a write up on that soon! GM was unable to be calculated on that website. Earliest data available was 2010. Thanks for sharing your first stock purchase with us. I’m curious to know if you still own those original KO shares from age 13. Thanks for the data regarding my stock purchases to see what might have been. Clearly, the winners are CVX and MMM. I know it’s always nice to look back and ask yourself the “what if” question and as you know hindsight is always 20/20. As I mentioned earlier, following the Foolish Four method worked out great in 1997 with double digit gains in each of the four holdings. Can’t complain about that. Thank you for taking the time to share what an annualized total return would have been with dividends. I love the Dogs strategy…DJIA components, out of favor companies, and high yields. That makes for a perfect trifecta. Small dogs have really worked well this year with Intel leading the charge. I actually sold Intel last month after another frozen dividend. Another variation to the strategy can be found at the dowunderdogs.com site where instead of yield, largest one year percentage drops are used as a contrarian strategy. I picked up IBM last year in the low 170s using this technique. If you go to the dogsofthedow.com website you can back test both strategies. I remember at the end of 1999 MO was yielding 8% and left for dead and Microsoft was flying high. The end of 2000 found the companies at opposite ends of the scoreboard. It is amazing how the Dow’s biggest loser can rebound the following year. Recent years have BOA and HPQ returning 100% the year after sitting in the Dow’s basement. I never would recommend a one stock strategy but the data is interesting nonetheless. Thanks for sharing this variant on the Dogs of the Dow strategy. I guess the central premise behind these theories is that you are investing in only top name companies. To be a Dow component is a pretty big deal, so when an Dow component falters a bit it becomes an interesting contrary pick to consider. Just remember, a whole picture must be looked at when buying “out of favor” Dow stocks. Are there other headwinds that are impacting the stock like some fundamental shift in business such as experienced by former Dow components Kodak and Woolworth. I guess that’s why you buy 10 or 4 companies to diversify a bit. As always, I appreciate your comment. Hindsight is 20/20. Better to be cautious and miss a huge gain than be reckless and suffer a huge loss. Stefanie @ The Broke and Beautiful Life recently posted…What’s YOUR Make or Break Number? So true about hindsight. But I guess the point of the Foolish Four strategy was to never hold a stock “forever” rather once a year re-balance and always buy high yielding stocks, this way, in theory, you’d always be buying great companies at discounts all the while collecting a nice yield. Thank you for stopping by. I’ve never followed any specific strategy such as the dogs but it does have some grounds of practicality. I wouldn’t follow it blindly which I think a lot of people probably do. You still need to do your research and learn the company, IMO. The good thing is that your learning experience made you money! Well said. That’s how I see my experience with the Foolish Four strategy. It was a trading experience that taught me, at least on some basic level, to look at high quality companies from a contrary perspective by buying out of favor Dow components. It happened to work out well for me in 1997 but that was the only time I implemented that strategy. I fully agree that further research must be done instead of simply buying blindly because of a high yield. As I mentioned to others, Kodak and Woolworth, two “solid” Dow components fell out of favor and stayed that way till their inevitable demise. Always do your homework. Thank you for stopping by. Interesting read, I have never followed any specific strategy like buying the dogs and out of flavour stocks. Following strategy is fine but remember to always think for yourself before pulling the trigger. I couldn’t agree more with your assessment. The way I see it a strategy, like running a stock screen, simply gives you a list of potential candidates to invest in. The final decision must be done thoughtfully rather than simply following blindly a strategy or screened results. Thank you for your comment. Interesting investing strategy, first time I hear about it. Rationally it makes a lot of sense that this sort of tactic works out in the long run, but I wouldn’t follow it blindly. Share price and yield are not what I’m excited about when looking for great businesses, but they of course help determine great entry points. Following any strategy or stock screen for that matter, simply gives you a potential list of candidates to invest in, not some blind result to put your money into. I agree, that the premise of the strategy is very interesting as it “forces” you to buy solid out of favor companies that have relative high yields. This contrary perspective is followed by many great investors but does require a lot of looking after. True there are other measures one must look at before buying a stock such as earnings and valuation metrics. I think the reason this strategy became so popular in the 1990s was seeming simplicity of the stock picking. Thank you for stopping by and commenting. I’m happy I was able to introduce you to this investing strategy. Sorry to hear about your misfortune subscribing to the Motley Fool. Personally, I never subscribed to any of their newsletters etc. I just learned about the Foolish Four system after hearing about the Dogs of the Dow and gave it a try. Needless to say, you can’t follow any newsletter or web site picks blindly. You are doing very well on your own and I’m happy to follow your updates. I enjoy your blog posts a lot too. Keep doing what you’re doing. Thank you for stopping by. I remember paying $40 or $50 commissions. The younger people in the crowd don’t know how much of a deterrent that was. I got squashed in the tech wreck in large part because the commissions were so high in my 401k that I just held on. Not long enough, however, but that’s another story. It’s true that anyone who started investing in the dot com era has no idea what commissions used to be. These days we read on the various PF blogs about keeping costs to 1/2% or less and we fuss when trades are $7 or $8 a trade. I can’t imagine what the chatter would be if average trades were $50. Thank you for commenting. Love these old school statements! I can speak for CVX because I’ve owned it for almost twenty years and reinvested the dividends. I wrote a post about it if you’re interested. Planning to write a 20 year anniversary post on CVX in May I think next year. It’s been a great stock to buy and hold. Look forward to your story about the 20 year anniversary for holding CVX. I’m looking forward to 2017 for my portfolio. 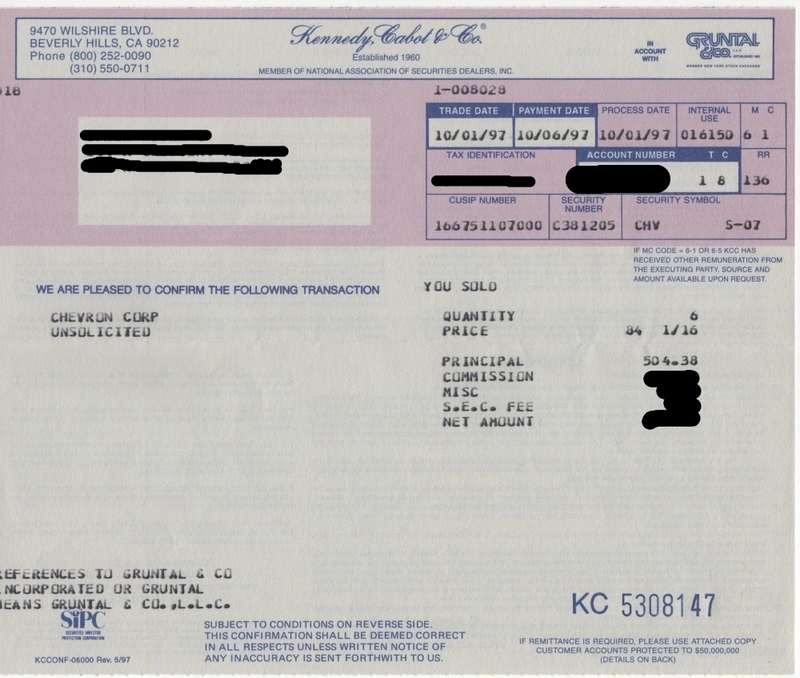 That will be my ten year anniversary since becoming a dividend growth investor. The old school trade confirmations are cool. No paper these days. Have you seen the trade confirmation from my very first stock trade back in 1989? Thank you for stopping by. Very cool story Divhut, thank you for sharing! I feel as though I may be going through a similar situation. I bought 326 shares inter pipeline about 4 months ago when they were about $30 a share now they $36.21, I am very tempted to sell because of the instant cash I could get from it, but I have to hold myself back because I do believe this company is a solid dividend growth stock. Well I sure hope i’m not regretting this decision 10 years from now! It’s all about your conviction in your investment. If you believe you are in a solid long term play that will grow for the next ten, twenty or even thirty years don’t feel compelled to sell. Of course, if there is ever a dynamic shift in your business or industry you have to reconsider. As I mentioned several times before… look at Kodak and Woolworth. Thank you for commenting. The stock market is a voting machine short term and a weighing machine long term. So if you own high quality businesses then you’ll likely do well. Thanks for the post. Cheers. A very interesting way to look at the stock market. Never heard of that before. Still, the message is the same. High quality growing stocks equals good long term investments. Thank you for stopping by. Only if you pay a sensible price haha. It’s rare to see someone mention the Foolish Four approach! They say it averaged about 24%, I believe, since they started doing it. Or at least, it was averaging that at first. I am a fan of The Motley Fool, for the most part. I even own some shares of The Great American Fund, one of their 3 mutual funds. As far as the Foolish Four approach, when I calculated it (around a year ago), it was GE, PFE, VZ and INTC. That is if you take out the highest dividend yield and buy the next 4, as they suggest. AT&T was the highest, with their insane yield of over 5%. I never fully invested in all of the companies; however, it did lead me to buy GE, which I still own and will continue holding. Their method has changed a bit from the book method of The Foolish Four. Now they say, it’s more accurate if you go by ratios. The Motley Fool said, with the old method “Additional research has shown that investors cannot expect such high returns from these strategies in the future”. So now they call it The Foolish Four RP (Ratio Procedure). Basically now, you divide the dividend yield by the square root of the price and you get a ratio. You then rank the stocks highest to lowest, drop the very highest and invest in the next four. It’s a little more complex, but the same principle applies. In fact, when I calculated both ways, I came up with the same four companies. I think the Fools have a lot of good things to say, but sometimes they seem to promise unreasonable returns with their stock picks. Overall, I have read and will keep reading their books. They taught me most of the things I know about cash flow, income reports, balance sheets and other financial docs. I’m glad you posted this. It’s nice to see someone talking about it. Thanks for sharing the updated version of the Foolish Four approach. Quite frankly, I haven’t been on the Motley Fool in a very long time but I do think for a newbie in the investment world it can be a great resource. Like you, TMF did teach me the basics of reading income statements, cash flow, etc. and I did liked their dividends section a while back too. I thought it would be fun to share some old trades of mine since I found those old paper trade confirmations while cleaning up. The old Foolish Four approach worked out for me back in 1997 but that was the last time I did that strategy. To be honest, I wish I would have just held my Chevron and 3M all those years since 1997. Imagine the dividend reinvestment on that going back. I’m glad you enjoyed this article and mention of the Motley Fool. Thank you for commenting. This is really cool, fun and interesting. It’s fun seeing what you can learn if you would have held on all of these years. I am going onto almost 6 years of investing with 3-4 real years and I’m starting to see the dramatic effect of holding on to strong companies. As a dividend investor – that’s the real reason why we get into this business – we find strong, well fundamentally sound companies who pay a nice increasing dividend. Great lessons, great story and experiences! It’s always fun to look back and see what might have been. We all do that from time to time. But, of course, it’s all about looking forward to those dividends coming in coupled with growth and compounding. Glad you enjoyed the article and my experiences with the Foolish Four strategy. Thanks for commenting. I never went totally into one certain strategy, but I can see how different segments of the economy could have performed well for an extended period of time. If I did not sell F, SBUX, AAPL, and DIS at one point I would have a much bigger profit. I bought 4 shares of MPC a few weeks ago at $79 and turned out really nice, but been nice to afford 400 shares instead. If I had a better paying job when bought 6 shares of CAT at $31.90 Id be a much happier camper. So little capital and shares that could have turned into much more money. Well get there though one step at a time. It’s all about the small steps. You can’t discount the power of many small steps over time when compared to one giant leap done just once. The Foolish Four strategy was an interesting one to consider when I tried it in 1997. It did work out well for me but I wonder what the longer term effects of those original investments would be had I simply held and reinvested dividends all this time. Do what you can when you can and look forward instead of backwards. In ten or twenty years time you’ll be happy you did. Thank you for sharing your purchases. Great article DivHut! Really highlights that buying and holding can really pay off in the long run if you are lucky enough to choose the right companies up front. Of course, this is much easier said than done. I actually just published a post (http://divgrow.com/2014/08/24/5-trends-i-look-for-when-examining-long-term-financial-statements/) on what I look for in long term financial statements when searching for new investments. I hope that my approach will help me ‘flush out the good ones,’ so I can largely avoid the ‘general motors and kodaks’, but I do like and agree with your “buy and reassess” method. I tend to think of myself as a buy and hold guy, but ‘buy and reassess’ is actually more my strategy as my opinion of companies I hold is constantly evolving. Thanks again for sharing – cheers! Happy you enjoyed the article. It can hurt sometimes when looking back and seeing an awesome investment that you sold “too soon” and the long term compounding effects of all those dividends. Looking long term it is extremely difficult to assess where a company will be in five years let alone ten or twenty. Hence, the “buy and reassess” method. Hindsight is always 20/20 and when you are in the thick of things it can be difficult to see a General Motors of Kodak implode. You might justify holding those positions thinking they are just experiencing a business cycle low and will be back, of course, that’s why we buy 25 – 50 stocks to diversify in case an investment totally tanks. Thank you for commenting. I dont necessarily agree with ‘blindly’ following a strategy like Motley fools “Foolish Four” method, like you mentioned there should be a lot more research involved when picking stocks with your hard earned money. I do however fully agree with using major indexes like the S&P/TSX 60 composite or the holdings of ETFs as a place to start looking for quality companies for my portfolios core holdings. You are correct in saying that one should never blindly follow a “strategy” when investing, and to be honest, I was younger and more naive regarding investing than I am today. I will say that the Foolish Four’s simplicity compelled me to at least try the strategy and that it did involve buying only dividend paying stocks which I understood back then to be important. In any case, I was lucky that all four purchases were profitable trades and that was my first and last time investing in that manner. Thank you for your comment.